“SinglesFly.com” keeps track of a user’s potential dates and alerts a user’s mobile device, anytime another member joins their “50-50” group by posting a public itinerary. All travelers, typically spend two hours at the airport before boarding the plane and being asked to turn off their wireless devices. If a user chooses to, they can receive alerts when any member in their “50-50” group is two hours away from boarding. 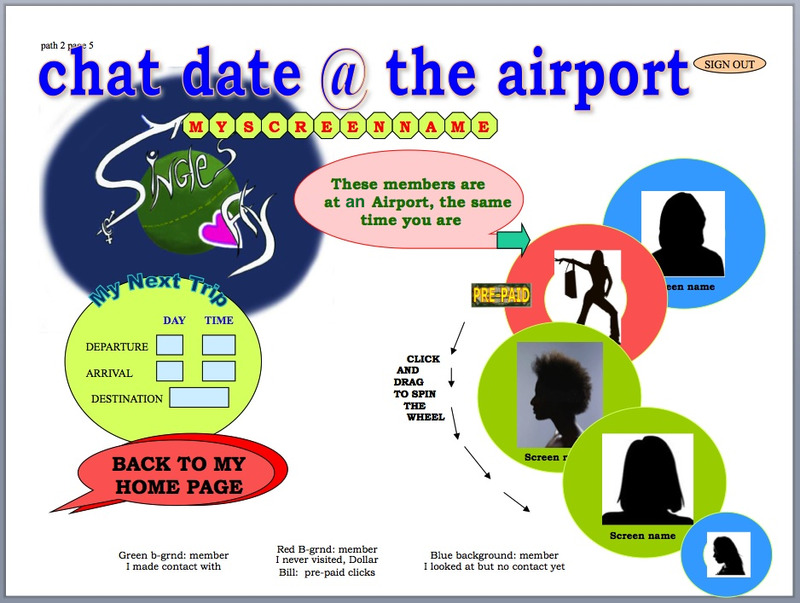 Once received such alert on their mobile device or by email, a user can contact that member for a “chat date at the airport”. Utilizing the “down-time” shared by both members, they can engage in online chat in order to find out more about each other and plan their meeting at their destination. This page functions exactly like the “50-50” page, having the members arranged on a “spinning-wheel”. When clicking a member’s photo, a chat window will open. If this is a first contact, $2.99 will have to be charges to the “click stash” of the member initiating, or the one accepting. as in the “incoming clicks” page, this page will display a schedule of the user’s “My Next Trip”.